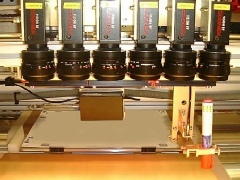 Machine Vision Systems can be used for many applications depending on the process being carried out. We select the most appropriate vision components for each project to ensure the best possible solution. This component only measures a few mm across and is viewed through laser optics prior to trimming. The edges, which you can see in green, have been found using edge detection algorithms. The illumination, as with all applications, is critical to a successful project. The lighting used here is a 1" DOAL (Diffuse On Axis Light). Once the edge is located, the X, Y and Theta values are relayed to the laser to enable trimming in the correct start position. CS Automation has extensive expertise in industrial machine vision integration. We have provided complete turnkey solutions as part of many of our Automation Systems.